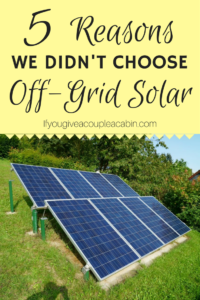 After buying an off-grid cabin we considered installing an off-grid solar electric system and were actually leaning toward doing so for a few months but, ultimately, decided against it and connected to the grid. 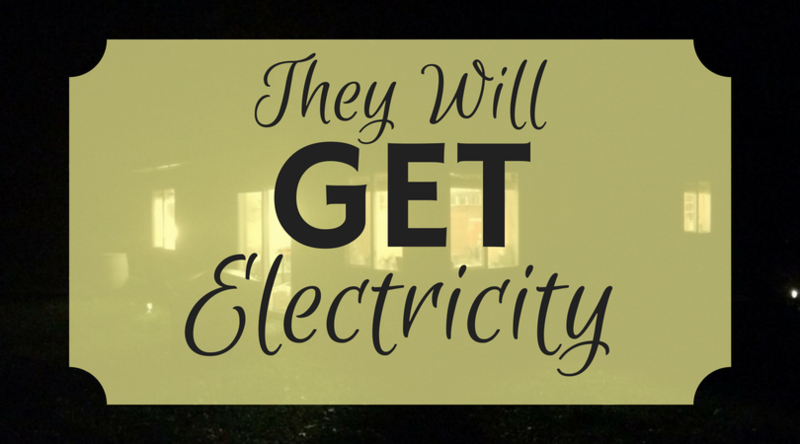 We can see this being a good option for some people and never needing to pay an electric bill is certainly appealing, but it just isn’t for us. Here are five reasons why we decided to go on the grid. 1. A solar electric system didn’t align with our financial goals. Eight years is the approximate life expectancy of the batteries so just when the system had paid for itself, it would likely need another major investment. We want to save as much as we can in five years to put toward building a house and eight years is longer than our planned timeline for saving to build our house. Not everyone has the same financial goals and the cost of electricity from the grid varies based on location. It is also true that many people who choose to be off the grid know that it won’t be financially beneficial. 2. 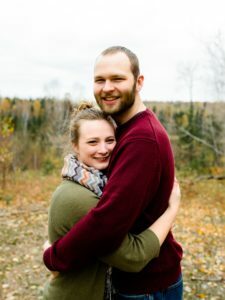 In northern Minnesota, days are quite short in the winter. When you live closer to the North Pole than the equator the days get pretty short during the winter. While we love winter and snow and don’t even mind the cold, the lack of sunshine is admittedly a downfall and it would be felt even more so if we depended on the sun for our electricity. It’s also not uncommon to have a long string of overcast days during the winter where we live so that makes it a lot worse. In order to have the amount of electricity we want to be able to use in the winter, a backup generator would’ve been needed increasing both the cost of the system and the amount of required maintenance. 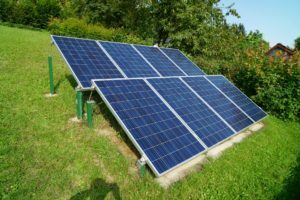 At a different latitude or in a different climate this factor may be more favorable to solar production so where you live is something to consider in deciding whether or not to choose solar power, either off-grid or grid-tied. 3. We didn’t want to be limited by lack of electricity. We have a wide and ever-growing variety of interests and hobbies and didn’t want a lack of energy stored in our batteries to limit us from doing something. For example, Bailey likes to make all kinds of art and one medium she does, pyrography (aka woodburning), can take a significant amount of electricity, or I might want to start a home business that involves welding. We didn’t want to take these possibilities away because we made a limiting choice. Something we’re doing now that uses a lot of electricity is baking bread in an electric bread-maker. If you know what you want to do with your free time and it doesn’t involve a lot of electricity this may not be an issue for you, but we want to keep our options open. 4. Experienced people in our circles recommended against it. 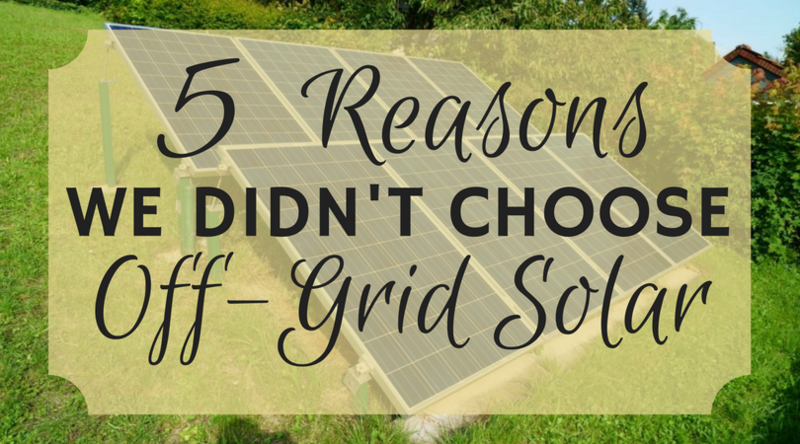 Family and friends of family who had lived off the grid and had solar electric systems told us that if they were in our situation they would not choose an off-grid system. When the people that you know who have lived with off-grid electric systems recommend against it that says something that reading about it on the internet or in a book can’t. Even though we don’t always listen to other people we decided to this time. 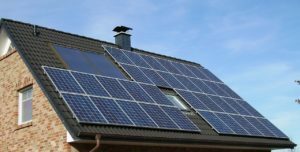 If you know someone who is living with off-grid solar power talk to them about it before making your decision. 5. We would rather spend our time on things other than electricity. You’ve heard the old saying “time is money” and it rings true in the realm of electricity as well. Solar panels are fairly low maintenance, but batteries require maintenance and solar panels need to be cleaned of dust and pollen and in our climate, snow. All of this takes time and there are a lot of things we want to do with our time from gardening to writing to building to having bonfires with friends, but making sure the batteries are topped off with distilled water didn’t make the list. In the end, this was one of the biggest factors in our decision. We decided we would rather trade some of our money for electricity than trade some of our time for it. If you’re considering whether you want to be on the grid or off the grid, these are some of the things you should consider and you may or may not come to the same conclusion as we did and that’s okay. If we lived farther south, in a different climate or had different financial goals we might have stayed off the grid ourselves. We will also probably get grid-tied solar panels at some point, possibly when we build our house, so that we can save money on our electric bill. If you want to read about off-grid solar from someone who decided it was for them check out Getting Started with Solar Power from Accidental Hippies. Whether off the grid or on, electricity is a wonderful thing and something we have a greater appreciation for now than we did before living without it for 9 months.